PrimePort has a number of fixed CTV cameras overlooking the port. A link will be provided once these are live. Timber built wharf with a reinforced concrete deck, constructed on the inside of a concrete block breakwater. The wharf is equipped for handling oil, tallow, acids, palm oil, molasses and logs. The wharf is also used for discharging bulk dry products. Timber built wharf with a reinforced concrete deck. This is a general purpose wharf and is used by the fishing industry, general cargo, vessel layup and cruise ships. Adjacent to No. 1 East is a fishing industry owned and operated cool store. A heavy duty concrete and steel finger wharf constructed in 2015 for priority discharge of international cement bulk carriers and loading of coastal cement vessels (currently operated by Holcim New Zealand Limited). Also used for discharge of bulk dry products, including fertiliser and stock feeds. The North Berth is used for unloading bulk carriers and the South Berth is used for loading coastal cement vessels. The South Berth is home to the Milburn carrier. The North Berth doubles as a berth for unloading bulk dry product. Timber built finger wharf with a reinforced concrete deck. This wharf is used extensively by the in shore fishing fleet and as a layup and maintenance berth for corporate fishing vessels. This is also the berth for PrimePort's two tugs. The North Mole is a continuous 460m berth, with 385m being timber construction and the remaining 75m constructed by heavy duty precast concrete. The wharf is predominately used for container operations, bulk dry unload and heavy lift unloads. Container operations are focussed on North Mole Outer and bulk dry operations on North Mole Inner. The concrete section of North Mole Inner (75m) is used for heavy lift unload. Northern road access via Port Loop Road (SH78) off State Highway 1. Southern road access via Heaton Street off King Street. 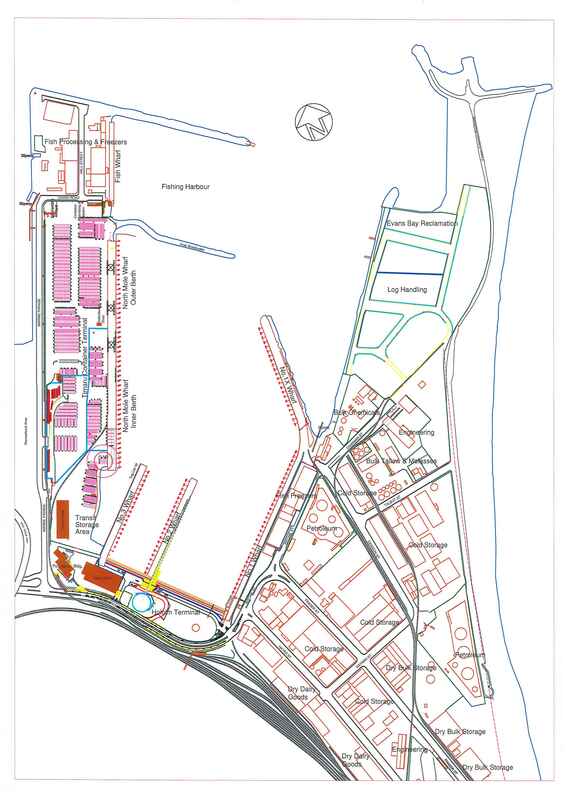 Timaru Rail Depot and shunting yards are located adjacent to PrimePort and the Port Loop Road. Rail sidings extend into the North Mole Container Terminal and PrimePort Log Yard.